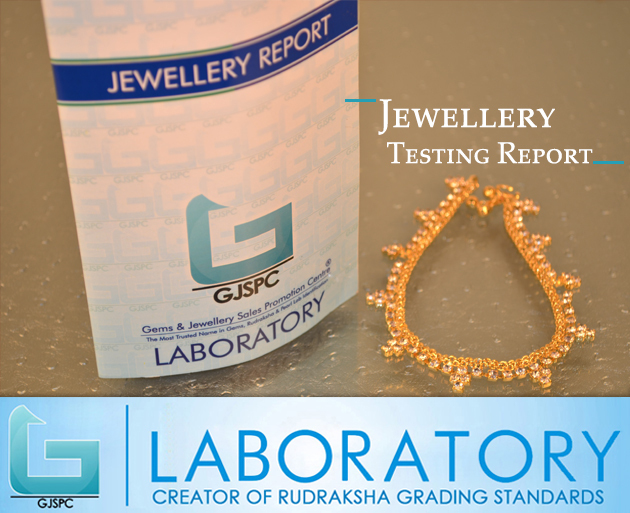 "GJSPC LABORATORY is one of the dedicated lab to the continuous improvement of the Gems & Jewellery Industry by providing the best possible services." GJSPC Laboratory was established in the interest to protect consumer & trader's trust in Rudraksha & other gemstone's industry, as in recent years the popularity of Rudraksha & of many gemstones has reached to a next level due to its medicinal and other benefits thus the frauds, cheating, treatment, modification with faces of Rudraksha & gemstones have also reached to new scales. To protect the consumer's trust and to help a trader to communicate the right details with each piece they sell. GJSPC Laboratory was established in Delhi by Mr. Dheeraj Gupta. 2. 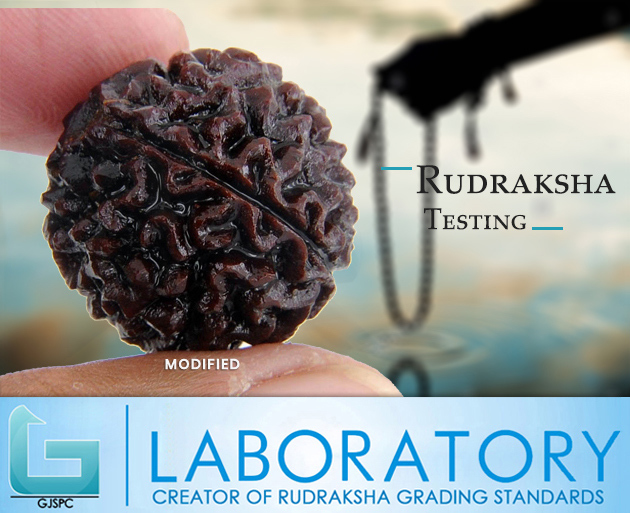 1st Laboratory in India (probably in Asia) to introduce the Rudraksha Grading System after a comprehensive research of 5 Years. 3. 1st Laboratory in North India for Pearl Grading Reports. 4. All the reports issued by GJSPC Laboratory can be verified online to boost customer's confidence and their interest in your brand. The GJSPC laboratory ensures for providing the true identity of the specimen submitted to laboratory for testing without any bias to the client. Any human controlled process to improve the appearance or value commonly known as treatment in the trade are always mentioned on the report issued by GJSPC Laboratory unless specimen submitted is not good enough in size or not providing the right clues towards the call or the specimen is not treated in any manner. Each & every report can be verified at www.gjspc.in by entering the report number or the document number. GJSPC Laboratory maintains 100% confidentiality towards their report & all the data collected or shared by the client. Each detail is handled & uploaded on our secure network to ensure that no data is being stolen or lost in any manner. Rudraksha Testing: The identification of rudraksha is done under the supervision of experts & report is generated according to their observations. Each bead goes for at least 2 opinions in the laboratory before the final observations are shared with the clients. Opinions taken for each bead is kept secret from the experts to avoid any kind of influence on the observation of the other expert. Each report carries the size, shape, weight, origin, modifications, enhancements, radiography and other test performed to prove the identity of the bead or was necessary in obtaining the results. Gemstone Testing: There are different types of gemstones with a wide range in variation in their subdivisions. 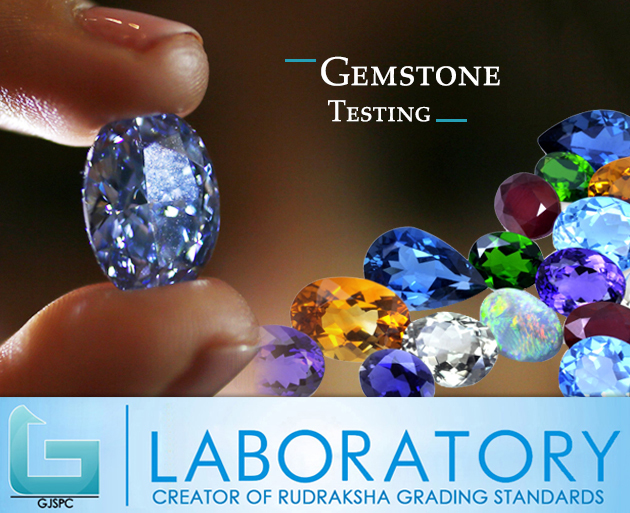 We identify and describe (if possible) the quality of the gem stone submitted for testing. Identification report includes the basic information of the specimen & any other necessary comments related to the nature or the treatment performed to improvise the stone or its appearance. Each stone is examined by at least 2 gemologists to avoid any conflict with regards to the identification of the stone submitted for testing. Observations are electronically recorded in our secured system to generate the report. Diamond Testing: GJSPC laboratory is helping in response to the artificial diamond/simulants and the synthetic diamonds to make aware the users. Diamond is the most precious gemstone and used in jewellery, but sometimes the original diamonds are replaced by the artificial ones. So to detect the difference between these two, the tests are done and the report is generated by the GJSPC laboratory based on the 4C’s developed by GIA (Gemological Institute of America). Colour Grading of each diamond is done in comparison to natural diamonds master stone set graded by GIA & owned by GJSPC Laboratory. 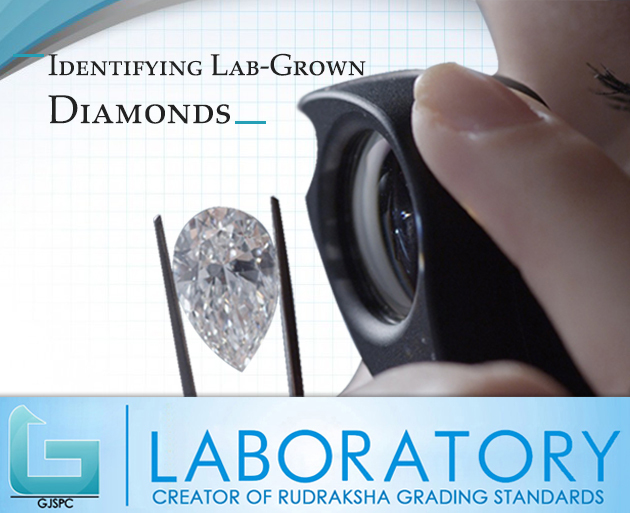 The only lab in Delhi uses its own natural diamonds master stone set. Diamond Grading reports are generated for a minimum 0.15 carat single piece stone upto any size. 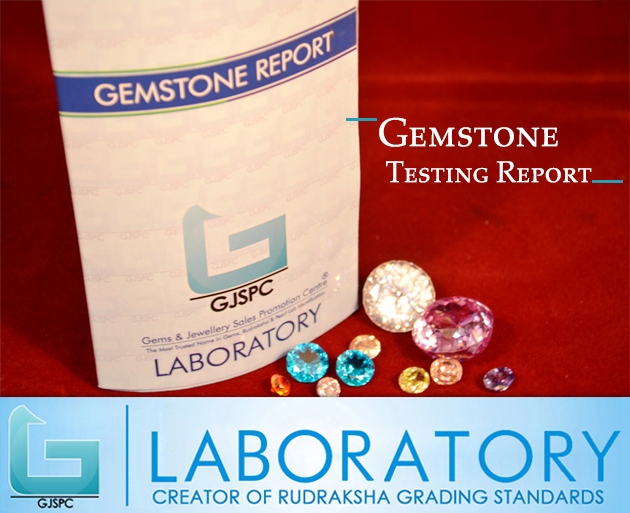 GJSPC Laboratory issues an assortment report for any stone less than 0.15 carats. Jewellery Testing: Jewellery is the most exciting thing ever happened to a woman; She loves jewellery, flaunts jewellery & boasts about her jewellery. In recent years the demands for diamonds have taken a big jump thus the quality analysis of mounted diamonds has become a necessity. GJSPC laboratory is capable of grading all size of mounted diamonds. GJSPC laboratory confirms with the client regarding the quantity & weight of the diamonds studded in article. 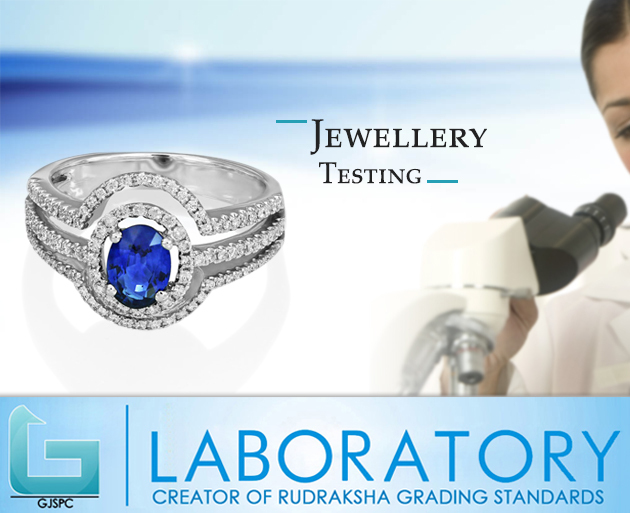 Laboratory issues the report based on the Colour & Clarity of the diamonds without being bias to the client. Our main aim is to deliver the trust among the users and we are able to achieve it by providing accurate reports. Packing and Sealing: GJSPC Laboratory provide customized packaging solutions to its esteemed clients at nominal charges. Most of the gemstones & rudraksha beads are very fragile thus utmost care is taken at GJSPC Laboratory to increase their life by providing the best possible packaging solutions. Gemstone Recommendation : This is said that the gemstones are not be adopted if it do not suits you. Always the recommendation should be taken by the experts first before adopting the gemstone. The gemstones and rudraksha are committed with the astrology. We recommend the gemstones and suggest about the rudraksha with reference to the astrology. It is very complex as it requires a deep knowledge of each field. The gemstone and rudraksha recommendation is done by the laboratory experts. Gemstones comes with different colors and designs whereas the rudraksha comes with multiple faced beads.